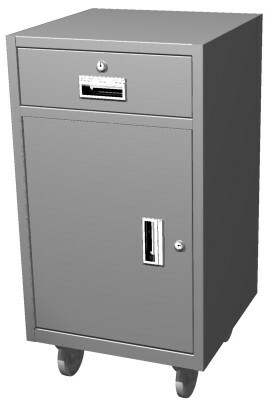 The USBS-built drawer and cupboard teller trucks accommodate to the removable cash drawer system (R.C.D.) and enable the speeding up of opening and closing procedures. This is the most efficient and secure method of transferring cash between teller stations and vault. The Model US102TT teller truck includes 1 "S" drawer, a storage compartment, 1 adjustable shelf, magnetic latch, 5" casters: 2 fixed and 2 swivel. Specify right or left door swing. Dimensions: 36-11/16" H x 19" W x 19" D. Wt. 125 lbs. Choice of 9 color finishes. Drawer and Cupboard Teller Truck includes 1 "S" drawer, a storage compartment, 1 adjustable shelf, magnetic latch, 5" casters: 2 fixed and 2 swivel. Specify right or left door swing. Dimensions: 36-11/16" H x 19" W x 19" D. Wt. 125 lbs. Choice of 9 color finishes.